Updates to Jeff's profile since your last visit are highlighted in yellow. Besides my work at the church, I'm the Grand Poobah and Doodle Master at "JP's Custom Caricature". Check out my Facebook page. 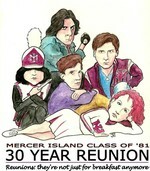 I created this as a promo for our reunion (yea, I know we were finishing college when "The Breakfast Club" was released, but I think it still represented our MIHS experience pretty well). Looking forward to reconnecting with all of you!